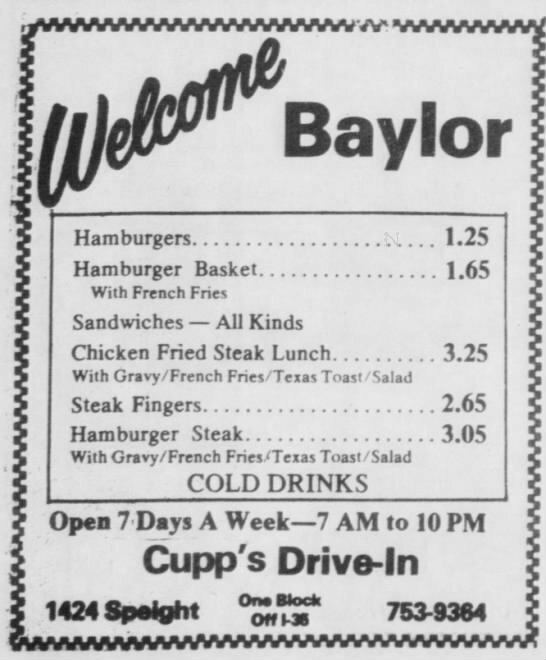 Nestled behind several fast food chains at Fifteenth Street and Speight Avenue, Cupp’s Drive-Inn has been offering diner favorites to local residents and Baylor students and staff for seventy years and counting. The small diner offers a window into the past, as the layout of the restaurant—with just four booths and eight old-fashioned barstools facing the flat-top grill—has remained virtually unchanged since its founding. The awning on the side of the building once sheltered carhops who took customers’ orders as they passed through for a quick meal. The location has a long history of being in the restaurant business. In the mid-1920s W. R. Bosley operated a restaurant there, followed briefly by the Tourist Sandwich Shop, which moved to 1426 Speight in 1930. For a time, the location was strictly a residence until 1940-41, when Robert P. and Clara Heaton opened Heaton’s Eatins, which served customers at that location until 1946. Price’s Hamburger Stand opened shortly after for a year before the location was purchased by longtime Waco resident Charlie Leroy Cupp and his wife, Bessie. It was briefly called Cupp’s Place before becoming Cupp’s Drive-Inn. Before entering the burger business in 1947, Charlie Cupp had previously worked for Geyser Ice Company as a delivery truck operator, and in 1946, he briefly managed Coffee Cup, a restaurant at 1514 Speight Avenue. 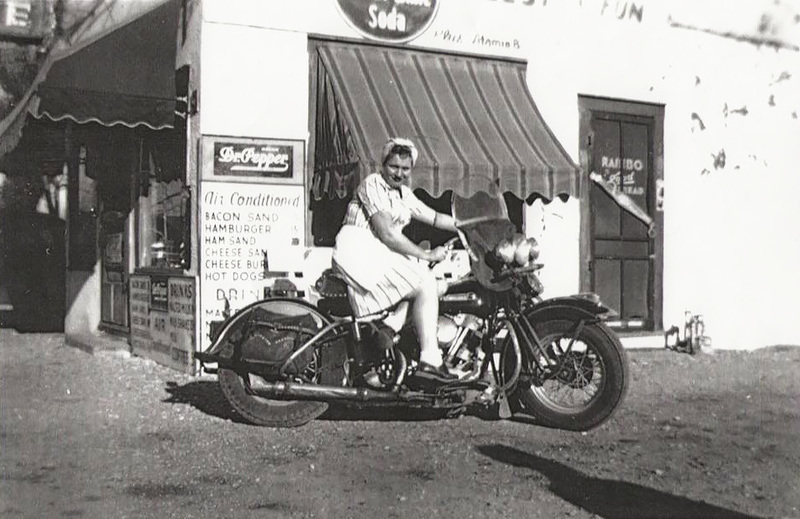 As business picked up at Cupp’s Drive-Inn, waitress Flo Owen came onto the staff, soon followed by Betty Johnson and Pat Walker. 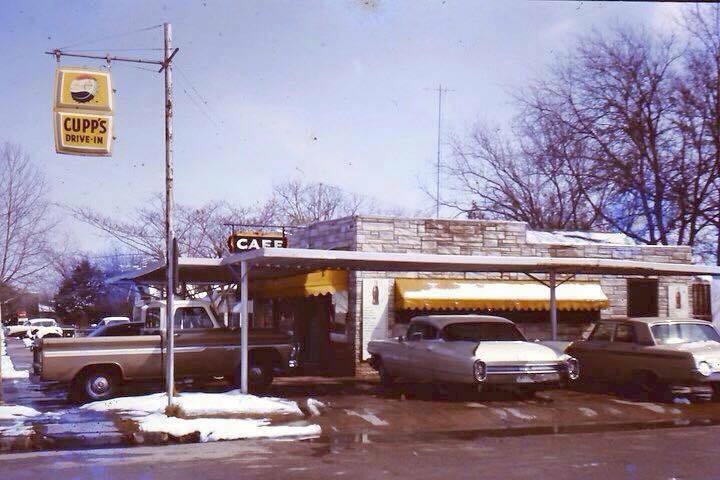 In addition to indoor dining, Cupp’s Drive-Inn also offered car service to patrons. Elvis Presley, then a young soldier training at Fort Hood, often frequented Cupp’s Drive-Inn in the back seat of family friend Eddie Fadal’s Cadillac, ordering double cheeseburgers with bacon. Elvis regularly retreated on weekends and days off to Waco during the sixth months of his army training in 1959. Fadal, a former DJ who met Elvis on one of his earliest tours to Texas, built an addition onto his house to accommodate his friend whenever he visited Waco. Willie Nelson, from nearby Abbot, has also been known to eat at Cupp’s since it first opened its doors. 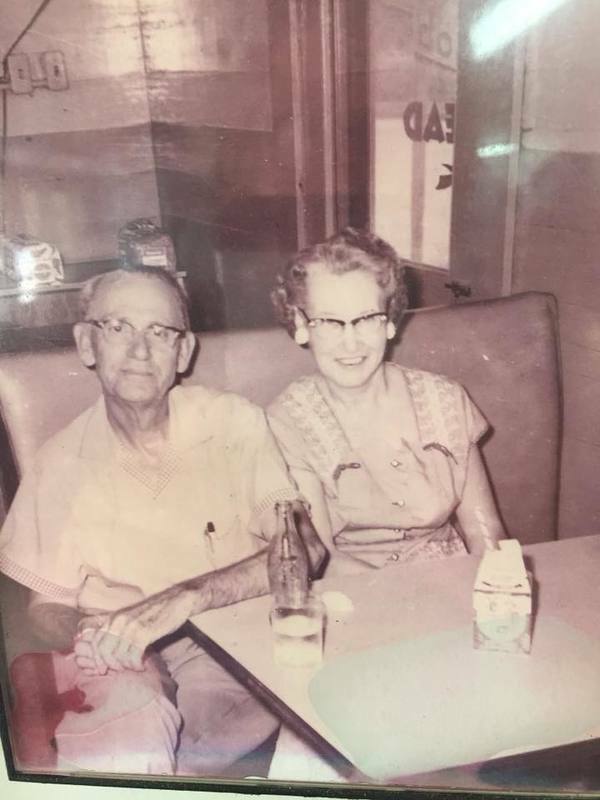 In the 1970s, the Cupp family passed on the business to longtime waitress Flo Owen, who would later go on to open another restaurant in Hewitt. In the late eighties, Owen approached Betty Johnson—who had worked for both the Cupp family and Owen—about taking over the restaurant. At first hesitant, Johnson agreed and together with her husband managed Cupp’s Drive-Inn from 1988 until retiring in 2010. The Johnsons children, Freddie Johnson Jr. and Sherry Caughenbaugh, then took over management and presently own the restaurant, serving breakfast and lunch. In the late nineties, the carhop feature was phased out with changing times. Trays would no longer sit straight on windows with the style of modern cars, and the service was not used frequently regardless. Because of this, focus shifted to strictly inside. Today, along with indoor seating, a picnic area outdoors serves as additional space for patrons. Cupp’s prides itself on its fresh ingredients, all sourced in Texas. They prepare their own meat for their well-known thin patties, using the same recipe from their 1947 founding. French fries and onion rings are still hand cut and fried to order. Their simple, no- frills menu options, classic diner atmosphere, and longstanding legacy in Waco have been keeping customers coming back—many since the fifties and sixties. Today, many of those customers now bring their children and grandchildren when they dine at Cupp’s Drive-Inn. 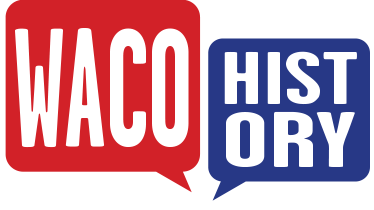 Ashley Yeaman, “Cupp's Drive-Inn,” Waco History, accessed April 19, 2019, https://wacohistory.org/items/show/183.